The Forbidden City stands in the center of Beijing. It is protected by high walls and a moat on all four sides and consists of dozens of halls and courtyards. The emperors of two dynasties, the Ming and the Ching (Qing), lived here with their families and hundreds of court ladies and palace eunuchs. From their throne in the Forbidden City they governed the country by holding court sessions with their ministers, issuing imperial edicts and initiating military expeditions. In Chinese the Forbidden City is called Purple Forbidden City. "Purple" doesn't refer to the color of the buildings or walls, but has a mythological origin. It is said that the Emperor of Heaven has his palaces in the region of the North Star, of which purple is the symbolic color. The abode of the temporal emperor, therefore, is supposed to have the same color. The Purple Forbidden City was inaccessible to the common people. Even the highest civil and military officers could not enter it without good reason. The Forbidden City was completed in 1420 during the Ming Dynasty. It was the home of 24 emperors of the Ming and Ching dynasties. Naturally it was the scene of many important events affecting the course of Chinese history, including political struggles and palace coups, some of them extremely tragic. After the republican revolution of 1911, the last emperor of the Ching Dynasty, then still a child, abdicated the next year. But he and his family and their entire entourage were allowed to stay in the palaces. They were finally expelled by republican troops in 1924. 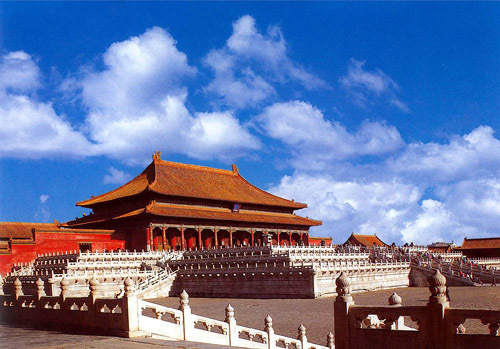 The Forbidden City was renamed as the Palace Museum and opened to the general public.